Enjoy an exhilarating stay in the heart of the African wilderness. Admire spectacular scenery of verdant volcanoes, lakes and the dominating peaks of the Virunga Mountains wreathed in spiralling clouds. 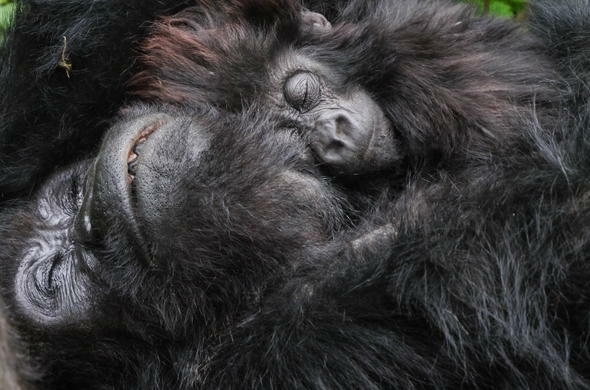 Spend your mornings trekking gorillas in the ethereal mist on the slopes of the Virunga Volcanoes. Track these magnificent creatures and discover their hideouts. Once you have found their hidden location, watch them interact with one another and feel the thrill as you enjoy close encounters. Shop at local craft markets for unique souvenirs. Relax in comfort and style in a stone cottage in front of a cosy fireplace. Enjoy flavoursome African cuisine. Cultural visits to a nearby village where ex poachers have changed their skills and have become performers. Arrive in Kigali and enjoy a scenic road transfer in a private vehicle to your Rwanda safari accommodation. Sit back, relax and enjoy your 2 hour journey as you pass through rural villages and farmland with a landscape dominated by volcanoes and towering mountains. 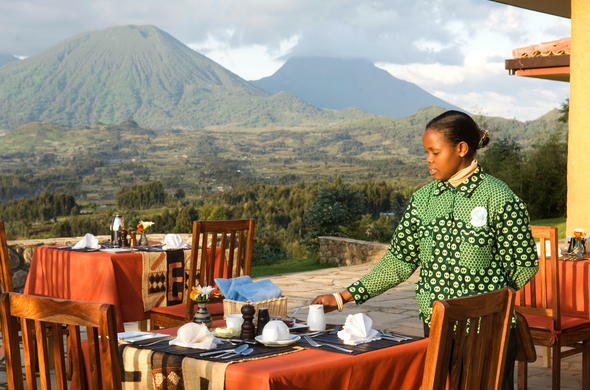 Savour a delicious lunch with picturesque views of the Virunga Volcanoes of Parc National des Volcans. Spend the afternoon at leisure and unwind after a morning of travel. After you have settled into your stylish cottage embark on a bird walking safari, familiarise yourself with the area and take delight in a profusion of colourful birds. Grab your camera and capture the exquisite landscapes in the soft afternoon light. Tuck into a delicious dinner; relax in front of the blazing fire in your private sitting room before retiring in your cosy Rwanda accommodation. Your adventure starts early today, so wake up to the dawn chorus with a hot beverage and enjoy a hearty breakfast before departing to the Parc National des Volcans headquarters. On arrival, you’ll meet your guide who will discuss the safety precautions and gorilla etiquette with you before you set off to meet these magnificent beasts. Take a quick safari transfer to the starting point, where your trekking officially begins. 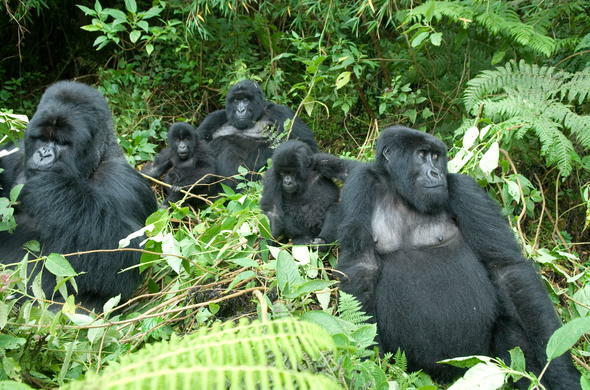 The duration of your trekking adventure is dependent on the area of which the gorillas are residing. The trek begins on the slopes of the slopes of Virunga Volcanoes and you need to be in good physical condition as the trek can be very physically demanding. 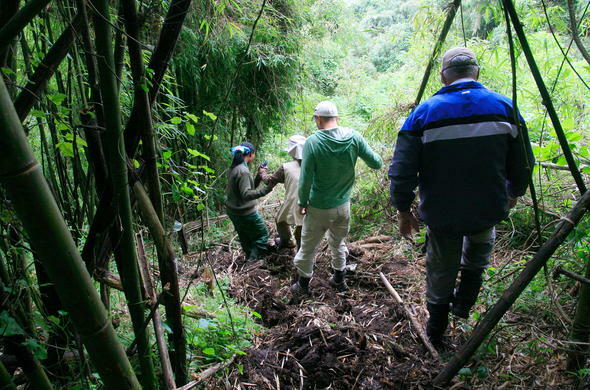 Starting on the cultivated slopes at the base of the volcano, you steadily climb through the dense forest, following the spoor of the gorillas. Once you have discovered their secluded location, you can spend an hour observing their animated interactions with each other. Feel the thrill as you come get a closer look at these incredible creatures and observe their unique habits. Set out after breakfast to see the golden monkeys. This local subspecies of the common Sykes monkey is endemic to the high altitude forests of the Parc des Volcans. There are two habituated groups at the foot of Mount Sabyinyo. You can spend an hour watching the monkeys’ antics before you have to head back to the camp. In the afternoon, you can spend the day at your own pace. Relax at the camp and marvel in the picturesque views of the volcanoes and lush forest. If you wish to see another aspect of Parc National de Volcans, you can take a drive to the bustling markets and shop souvenirs and crafts. If you would like to learn about the country’s history, you can visit the genocide memorial in the area, or learn about the different conservation projects in the area. The time has come to say goodbye. Capture your last few snaps with your camera to remind you of a thrilling African gorilla safari. Enjoy a delicious breakfast before your road transfer back to the airport.